OTC scope of work : Project Engineer and Contractor’s representative at construction site. Design and Technical supervision of gas treatment plants installation. Coordination of construction subcontractor’s activities. Supply and logistics of Contractor’s material, equipment and mechanisms on delivery to construction site. Similar projects were executed in Sayanogorsk and Krasnoyarsk. Contractor’s scope of work was to install a number of Gas Treatment Plants in the process of KhAZ construction and KrAZ modernization. Gas Treatment Plant includes installation of a large-size filter which is 50*25*15 m size. Target of BrAZ project was modernization of production service systems using modern technologies. Such modernization can significantly decrease environmental impact and improve production efficiency. The initial stage of modernization consisted in equipping of one shop with modern automatic alumina feeding system. The final stage of modernization consisted in installation of high-performance gas treatment plant. KhAZ has been built for 24 months. Efficiency of gas treatment (fluorochemicals) is 99,5%. Dry gas purification works on Abart technology, developed by Norwegian company Alstom. KrAZ modernization consisted in implementation of dry anode technology, in equipping with modern automatic alumina feeding system and dry scrubbing plant. 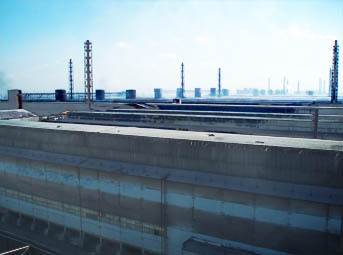 This modernization resulted in reduction of harmful substances emission rate per ton of product: fluorine hydride – 1,5 times, tarry substance – 2,7 times, BaP – 2,5 times. a Our personnel were involved into design and technical supervision of gas treatment plants installation. We represented the Contractor on construction site. BrAZ is the largest aluminum producer in the world. Our personnel were involved in implementation of improvement program which started in 2007.